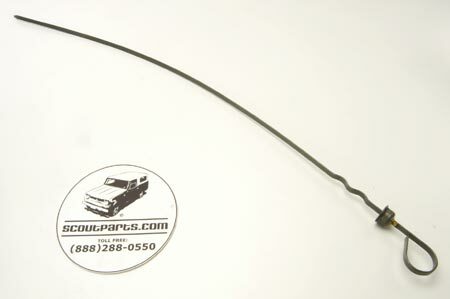 If you have lost your dipstick, we have lots of new ones! This is a brand new oil level indicator for 266, 304, 345, and 392 motors. This fits all V8 engines that have the dipstick tube on the rear side of the engine. This will not fit engines that have the dipstick on the timing cover. This has been improved over the original unit, because the cap has been brazed on so it will never come loose and fall off again! Many times the old dipstick has fallen out; or the cap has disappeared so that oil is blowing all over your engine compartment. Not only is this messy, it means your PCV system is not working right, which can shorten the lifespan of your motor due to corrosion resulting from the inability of water vapor to be ventilated out of the motor. Why take chances on your $3000 motor for lack of a $23 part? Get one today! If you need the dipstick tube too, see SP13577 or SP13578.